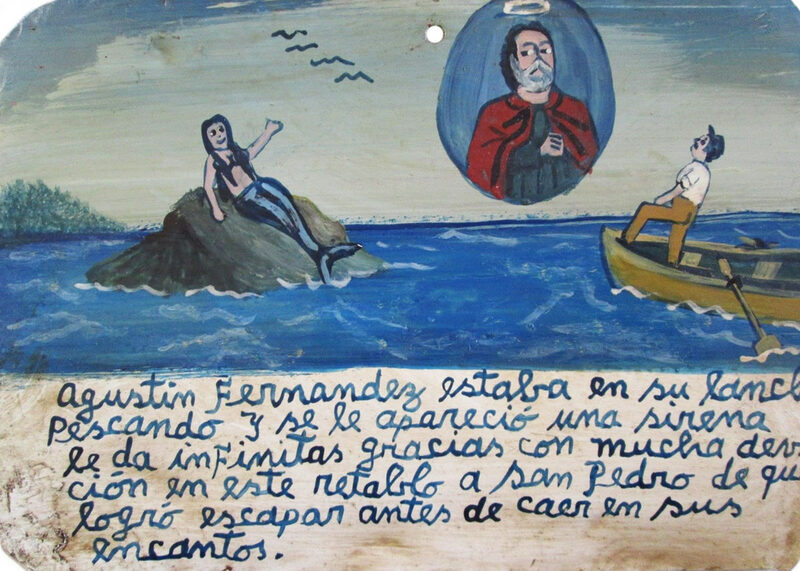 Agustin Fernandez was fishing in his boat, and a mermaid appeared to him. 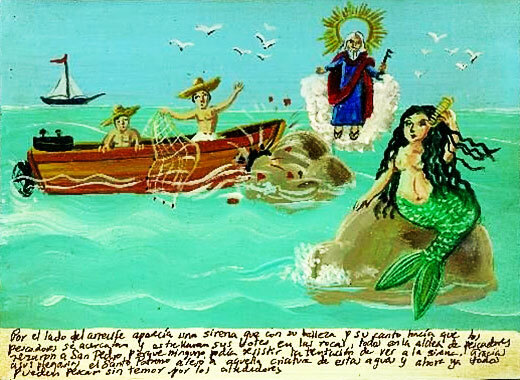 With great devotion, he thanks Saint Peter with this retablo for he managed to escape before falling for her charms. It was still night when I went fishing in my boat. 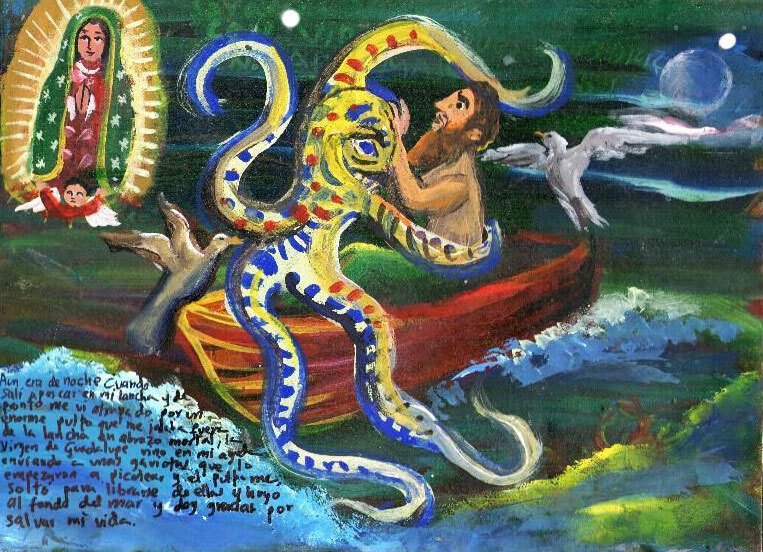 Suddenly I was caught by a giant octopus who grabbed me in its deadly embrace and tried to pull me out of the boat. The Virgin of Guadalupe came to help me—she sent seagulls that began to peck the octopus. The octopus let me free trying to save himself from the seagulls and went to the bottom of the sea. I thank for saving my life. The brothers Pedro and Pablo were fishing at the beach of Acapulco. Suddenly a sailfish jumped out of the sea and attacked us. A mermaid appeared near the rocks. She was attracting the fishermen with her songs and beauty, and the boats kept crashing on the rocks and smashing in splinters. All the fishermen in the town were praying to Saint Peter because no one could resist her charm. 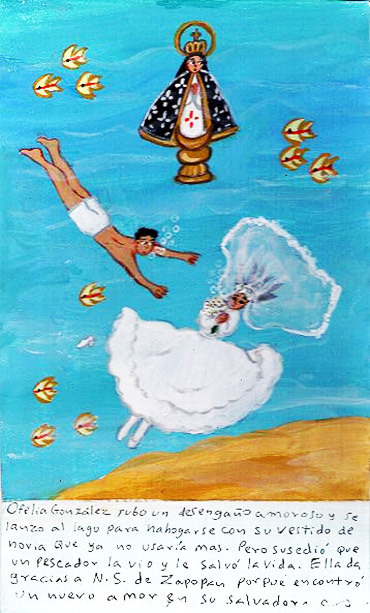 Thanks to the prayers the saint drove the mermaid away. Now everybody is fishing without danger. 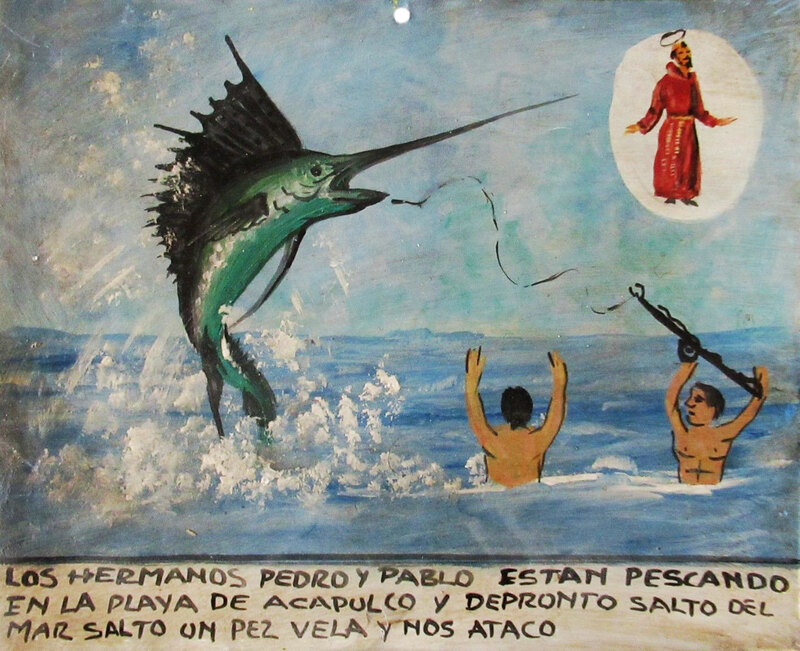 I dedicate this retablo to Saint Peter because he helped me to win the fight with a sailfish which cost me a lot of work and for which I received a big reward. 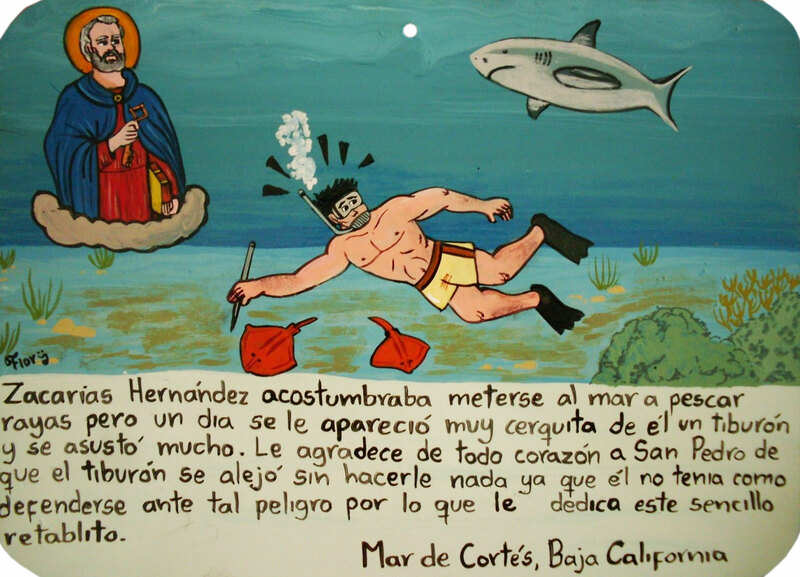 Zacarias Hernandez used to get into the sea to fish stingrays. But one day a shark came very close to him. He thanks Saint Peter for the shark get away without doing anything to him. 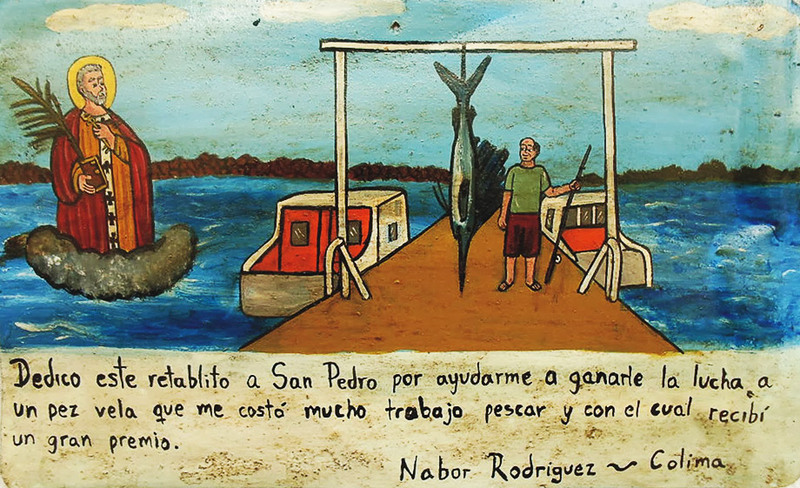 He couldn’t have defended himself against such danger, so he dedicates this retablo for that. Gregorio fell from the fishing boat and hit his head. 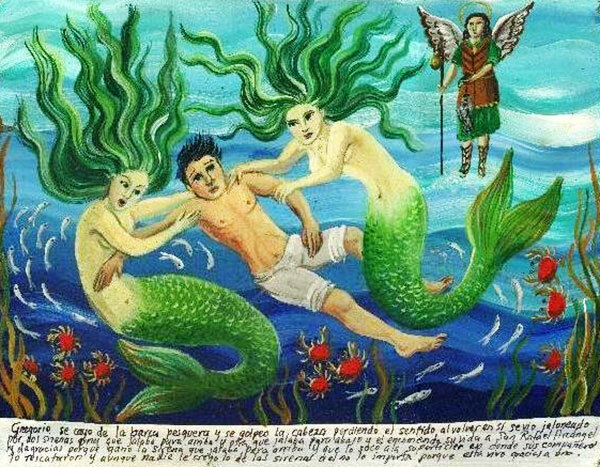 He lost his conscience, and when he regained it back he saw two mermaids pulling him in different directions—one to the top and the other to the bottom. That moment he entrusted his life to Saint Raphael the Archangel. He thanks him because the mermaid who pulled to the top won, and he got to the surface where his buddies could grab and save him. Although nobody believed in the mermaid story, he didn’t care because he stayed alive. For weeks, I was coming back with the empty net because there were no fish at all. But one day I met mermaids. I looked at them mesmerized, and they came closer out of curiosity. They gave me some fish. The mermaids just sang, fish swam over to them, and the mermaids took the fish and threw it in my boat. I go to the mermaids every since, and they give me fish. Now we have a lot of food at the house, and I thank Saint Raphael the Archangel for this amazing miracle. Ricardo Arriola went fishing in the open sea with his buddy Eliseo. 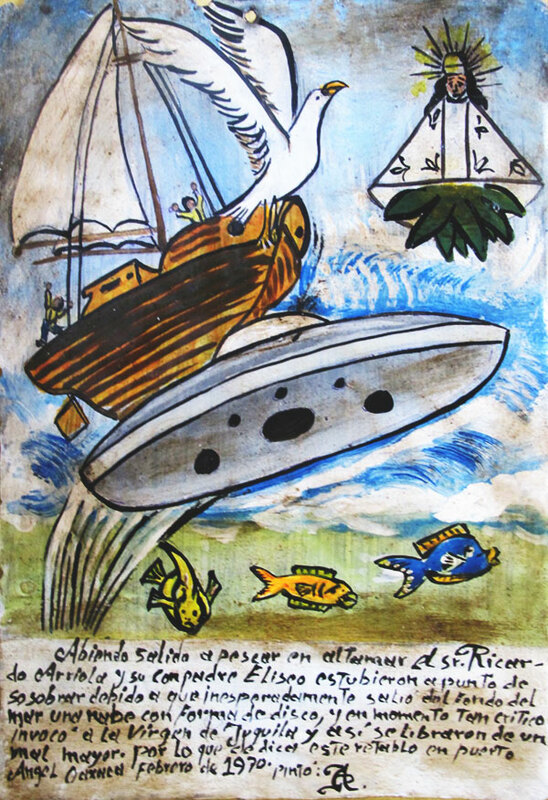 They were preparing to come back when suddenly a ship in form of flying saucer came out of the water. That moment they prayed the Virgin of Juquila, and it saved them from the danger. 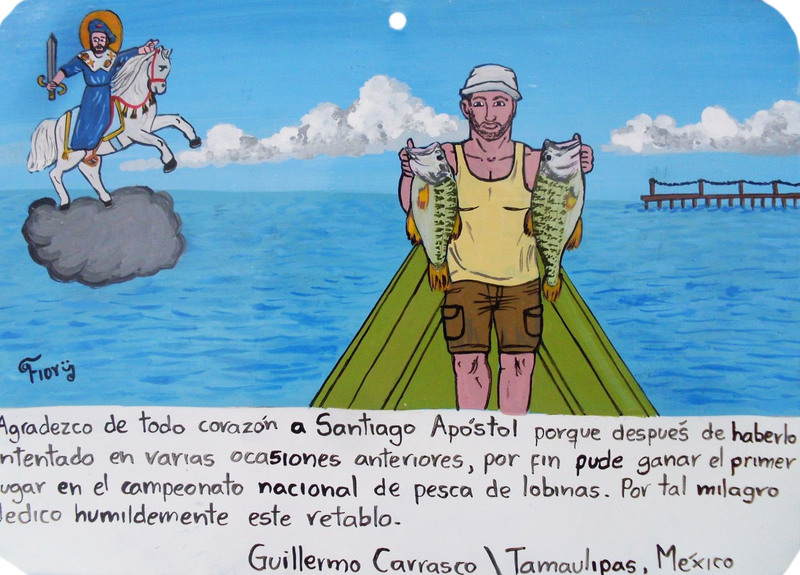 They dedicate this retablo. One mermaid had an idea to get into my boat. The first time, I was fascinated with her beauty, but then she began to return all my fish back to the sea. 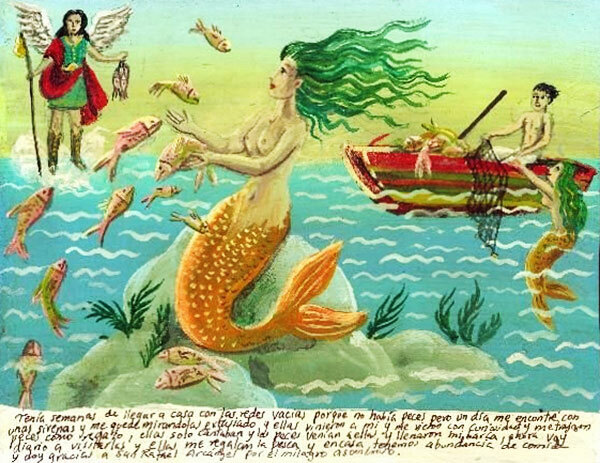 I didn’t like that, I was working hard to catch all this fish, and the mermaid was undoing my work. I prayed the Virgin because it didn’t matter if I changed my way, the mermaid always found me. 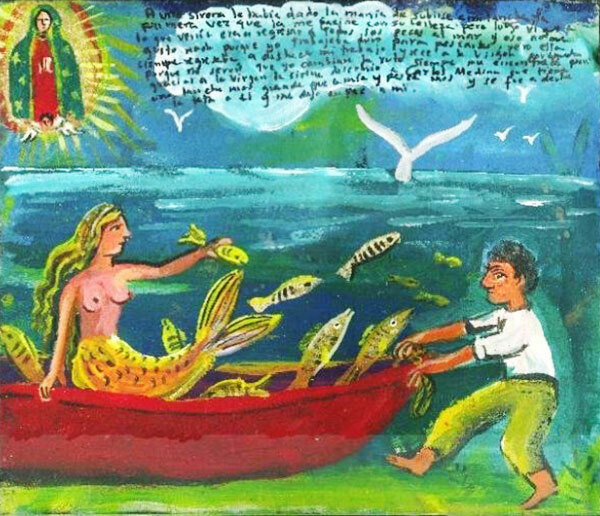 Thanks to the Virgin of Guadalupe the mermaid finally left me and went to bother Carlos Medina who had a bigger boat than mine and used to catch more fish. Ofelia Gonzalez got disappointed in love, so she threw herself into the lake wearing her wedding dress, since she wouldn’t use it anymore. But it happened so a fisherman noticed her and saved her. Ofelia thanks the Virgin of Zapopan because she met a new love in her savior. 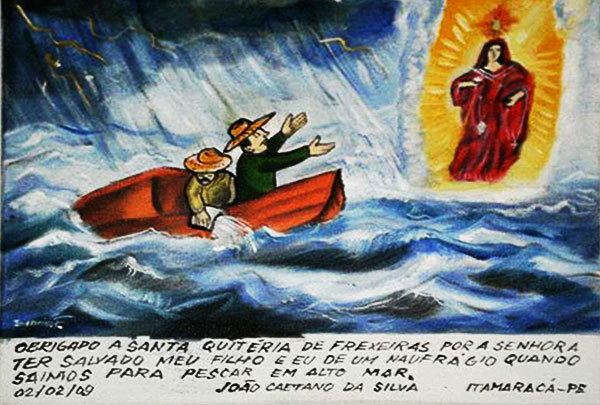 I thank Saint Quiteria of Frexeiras for saving my son and me from shipwrecking when we went fishing in the open sea.